Over the past year, I've had the chance to meet and work with a ton of different Christian business owners. Because our site is more focused on productivity and business tutorials, I haven't had the chance to really share some of these awesome people with you. So, below you'll find a list of people we've worked with, people we've admired from afar and people doing amazing things in the business community. Check them out! Jen Gordon sells these beautiful postcards in bundles. They are a perfect way to spread some love to your friends and family. Personally, we use a couple in some photo frames, we have our favorite recipes on them and we use them as thank you cards with our friends. Jen's working on building up her business, and right now she's running a deal for 2 decks for $24. Check it out below if you want more details. I partnered up with Faithbox last year to review their products and share a promo code. Their mini bible studies were simple and quick to do and these boxes would make a fantastic gift. Another great subscription box that would make a great gift is Bette's box of blessings. They were kind enough to send me a box to review and it was beautifully packaged and full of some great goodies (including an adult coloring book, music, and a cross ornament). Check out their box if you're looking for a fun order for yourself or a gift idea. P.S. You can use the promo code "NORA" for $5 off your first box! This is one of the companies we admire and take a ton of inspiration from. The She Reads Truth Bible is what you can find in our newest Bible study videos (see below). I also LOVE using their app and study books. Overall, they create simple, beautiful products that really help you focus on the word. Another brand we admire is Emily Ley. Although they're a planner company, Emily wrote a book (grab it here) about getting organized, accepting God's grace and loving people well. Their brand is full of beautiful design and they a great example of how a Christian business can love peoplle well. One of my favorite resources for learning about the Bible is the Bible Project's videos and podcasts. If you're new to the Bible, or you just want to dig deeper with word studies, historical contexts and understanding Biblical culture, these guys will be your new favorite YouTube channel. There are a few Christian blogs on this list that I read regularly, the first is this beautiful site by Rachel Green is full of awesome branding advice and design services, but underlying all her work is her faith and intentionality in pursuing God first. Chamel is one of my favorite people. 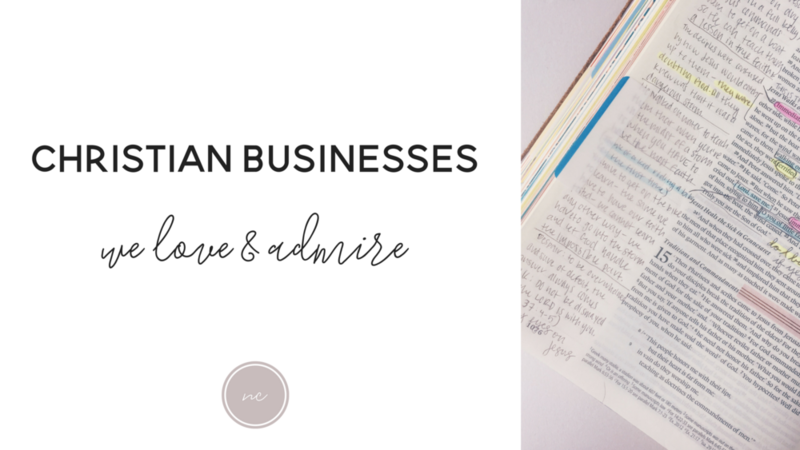 We've worked together a few times (she has guest blogged for us on this site) and her business is such an awesome resource for anyone wanting to grow their Christian based business. Give her site a look through and tell her I said hello! I hpe you'll take a peek at some of these awesome business, and let me know what some of your favorite are in the comments below. Have a great weeke eveyone!